When things go wrong in Door kickers they go wrong fast. In less than half a second you can go from having four heavily armed, highly trained SWAT to four bloodied chalk outlines. Usually it’s because of you. You didn’t order a flashbang, you didn’t time the breach, you didn’t cover an angle. You’ll just have to reload and do it right this time, won’t you? 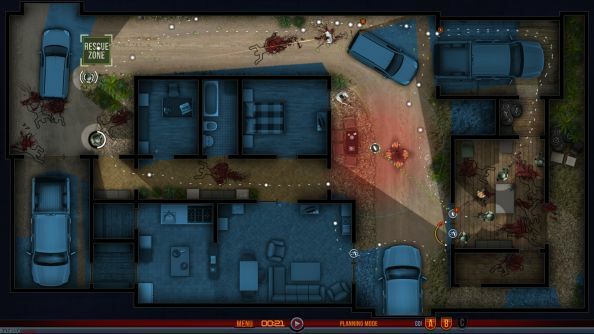 Like SWAT and Rainbow Six before it, Door Kickers charges you with the command of a team of military types as they try and defuse situations like hostage takings and bomb threats. 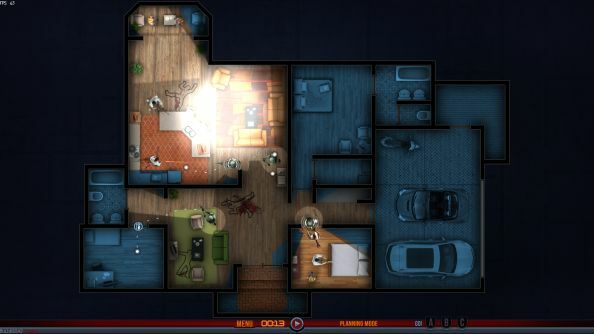 Unlike those games, Door Kickers relocates the action to a top-down perspective. This lets you see the entire level like a floor plan, making it much easier to track your team’s movements and organise their actions. It’s a little like a singleplayer Frozen Synapse. While not turn-based, you can pause the action at any time and stack up orders for your men. Early missions are all Sweep and Clear jobs. That’s a minor grace in an otherwise hard as kevlar game, especially if you mistake your team for supermen, as I did. A single shot can down an officer. Sending all four of your men charging into a room will end in a lot of dead cops and, if not a failed mission, a rubbish score. You’ll learn fast that there’s always a better option than going in loud. Even in this early alpha, Killhouse Games have provided ways and means to clear rooms without putting your men at undue harm. 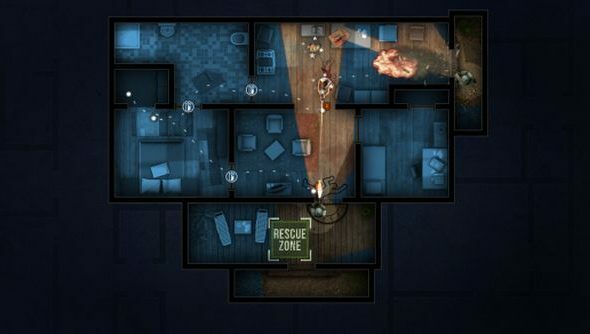 If a room has multiple entrances you can stack your team up on both, enter at the same time and flank the criminals. Or, better yet, toss a flashbang in first. Or, run a snake cam under the door to see how many men you’re dealing with. Or, say “Sod this” and blast your way in with a breaching charge. Taking out the terrorists, the hostages, and any vases that get in the way. You always have options and knowing how and when to use them is part of Door Kickers’ joy. By the later levels you become masterful at clearing buildings. It’s a good job, too, because Killhouse have designed levels full of difficult architecture: corridors of tight turns, lots of rooms, and awkward angles make every mission’s packed with possible hiding spots you can be jumped from. You’ll learn to split your team across multiple deployment zones. Rescuing hostages with a pair of SWAT that have infiltrated the rear of the building while the rest of your team draw fire with a loud diversionary assault at the front. Even in this early alpha Door Kickers is worth its asking price. Future updates are bringing persistent squad members who gain experience and new kit, a full customisation screen where you can develop different loadouts for your men, and randomly generated missions that take the current levels and populate them with different objectives. It’s even going to receive an editor. Hopefully, after launch its Steam Workshop is going to fill with custom campaigns. It will be glorious. If you’re waiting on Irrational to make a SWAT 5 you’d not be wasting your time to dive wholeheartedly into Door Kickers. You can buy Door Kickers from Steam Early Accessfor $9.99,or try a stripped down alpha version for free direct from Killhouse Games.